Because of its tasty flavor, Elderberry Syrup is a wonderful cold and other viral remedies. Elderberry fruit and flowers contain many healthful properties including antioxidants, vitamins A, B, and C, flavonoids, tannins and the list goes on for its ability to strengthen the immune system. It is probably best known for its ability to knock out the viruses when taken immediately when taken at the arrival of common symptoms. 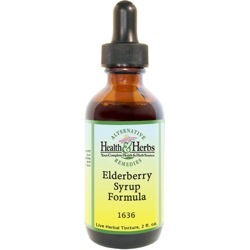 Studies have shown that Elderberry treated flu symptoms faster than over-the-counter medications. Elderberry helps to break fevers and works as a simple cleanser, an antioxidant, a diuretic, an anti-inflammatory, an anti-catarrhal and mild laxative. This useful herb is an effective remedy for coughs, sore throats, hay fever, neuralgia, rheumatism, sciatica and even skin disorders. In India and Europe, Cinnamon has been used traditionally as a warming herb to treat the cold and viral infections. It has also been approved by the Commission German E for treating gastrointestinal distress and stomach spasms. There are many health benefits of honey for its enzymes and combination with cinnamon’s essential oils it qualifies as an anti-microbial food that stops the growth of bacteria, viral attacks as well as fungal infections. It is also worth mentioning that in Ayurvedic medicine, honey is known as 'yogavahi', which means “the carrier of the healing values of to the cells and tissues”. In combination with other herbs in this formulation, the special quality of honey enhances the medicinal qualities and helps it to reach deeper tissues in the body more effectively. In Spain, scientists have proven that honey contains a natural ingredient that kills the germs and saves the patient from symptoms of viral infections. Honey and cinnamon is an excellent herbal extract for boosting the immune system, removing regular fatigue and increasing longevity. Clove extract helps fight germs, viruses, and bacteria as well, and it encourages the loosening of phlegm from the respiratory system. It also promotes sweating with fevers, colds which can be very healing. Clove tincture also stimulates circulation and gets the blood flowing to the skin, making it useful for people who have cold extremities. It contains nutrients such as calcium, magnesium, phosphorus, potassium, sodium, and vitamins A, B-complex and vitamin C. Clove may help relax the smooth muscle lining of the digestive tract and help to stop vomiting, relieve diarrhea, gas, intestinal spasms, and nausea. Ingredients: Elderberry Whole, Elderberry Flower, Cinnamon, Cloves, Honey, Distilled Water and 5% Alcohol. Instructions: Use 6-30 drops in juice or water, under the tongue or as desired. May be taken 3 times daily. Shake well. Store in cool dark place. Keep out of reach of children.